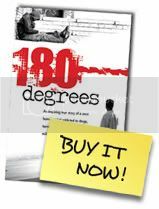 For those that read the book 180 Degrees, you know that I am a strong believer in God, however I am not a follower of any religion. Although my wife and kids are Jewish, my dad was Presbyterian and my mom Catholic, I chose a different path. My belief in God is always evolving and I am committed to the process of discovering new awareness of God and how the Universal energy is working in my life and how I (we) relate to it all. As the word Namaste is used in my book; I totally respect any and all paths to God … and for those that do not believe in God, I respect your path too.